Last week, Studio Ghibli's Hiromasa Yonebayashi was talking about what kind of anime he would like to make next. This week, he's revealed he already left the studio. Yonebayashi directed 2010's Arrietty from a script Hayao Miyazaki co-wrote. At the time, he was the youngest person to helm a theatrically released Studio Ghibli film. Now 41 years old, Yonebayashi recently directed When Marnie Was There, which will be released in the U.S. this spring. With Marnie's international release just around the corner, Japanese website Oricon is reporting that while at an event for the movie's Japanese DVD and Blu-ray release, the director said, "I'm not at Ghibli. I quit the studio last year, and I'm no longer at the production company." Yonebayashi said he talked to Studio Ghibli's Yoshiaki Nishimura, who produced When Marine Was There, about what this would mean. "I don't know yet what kind of shape this will take, but I'd again like to make something [at Studio Ghibli]." In August 2014, it was revealed that Studio Ghibli was restructuring, causing some to worry about the studio's future. This past February, Studio Ghibli producer Toshio Suzuki said, "Right now, Studio Ghibli is open, but not in production." He added, "We're worrying over what would be good to make." Yonebayashi began his career at Ghibli in the late 1990s, doing clean-up animation on Princess Mononoke and worked his way up to director. 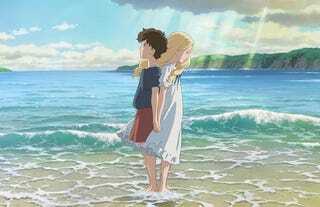 Last week, Yonebayashi said that he wanted to do something that's different from Marnie, maybe perhaps like Ponyo. After revealing he quit Studio Ghibli, he talked a bit more about his future plays, saying he wanted to try his hand at making a fantasy anime. Studio Ghibli has made a couple of those. They're pretty damn good.